Not to be rude..but yeah I knew that. So, I'll call it my nitrate reducer with extra pods. 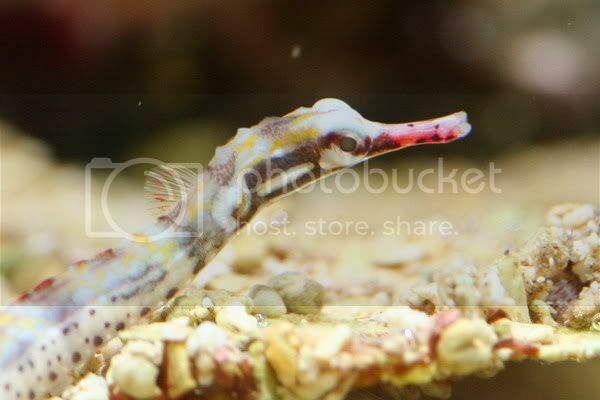 The pods do make it to the display...so this toothpick size pipefish is of no concern to me. Excess on occasion is exhilirating. It prevents moderation from acquiring the deadening effect of a habit. Not rude at all. Just trying to be informative. Someone who does something like that and still calls it a fuge can't be guaranteed to know that it defeats the purpose. I said, "look honey, we paid the mortgage and we have all this money left over for the tank." Her response confused me. She said we still needed to buy food and pay the utilities. Want to see my tank? click on my Red House..
Bebo, where'd you get him? Cool...I've never seen a redstripe, what can you tell us about him? They are hawaiian endemics, I've seen lots of them, but they are really shy. That is the main reason I don't have two prs, I couldn't catch the female of the second pr. 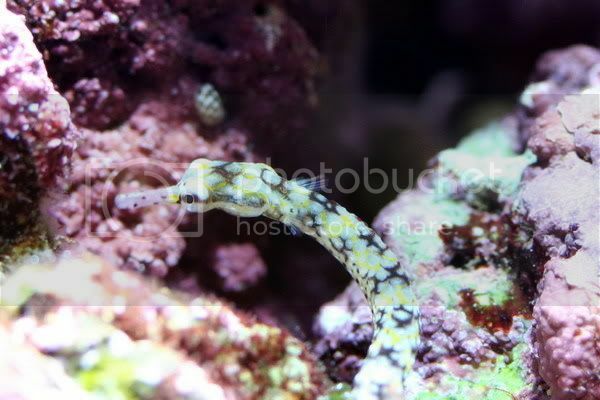 Mine eat all sorts of frozen foods and the pr in my reef also have a steady supply of sm live foods available. The single male is in my fish tank and he holds his own fine. 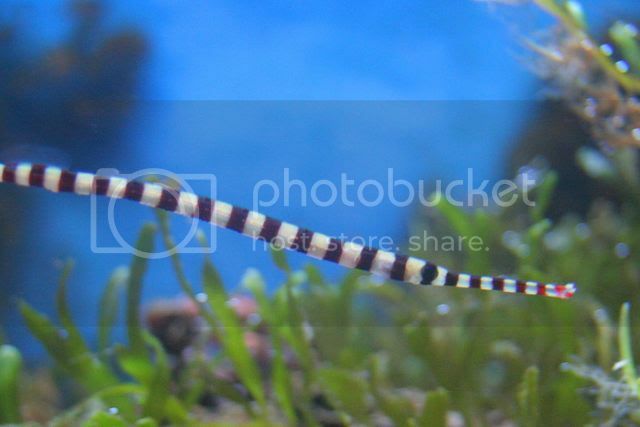 They are parasite pickers like the bluestripe but they get 7 or 8 inches. I've never seen mine do this, but all books say they do. The scientific name is Doryrhamphus baldwini. 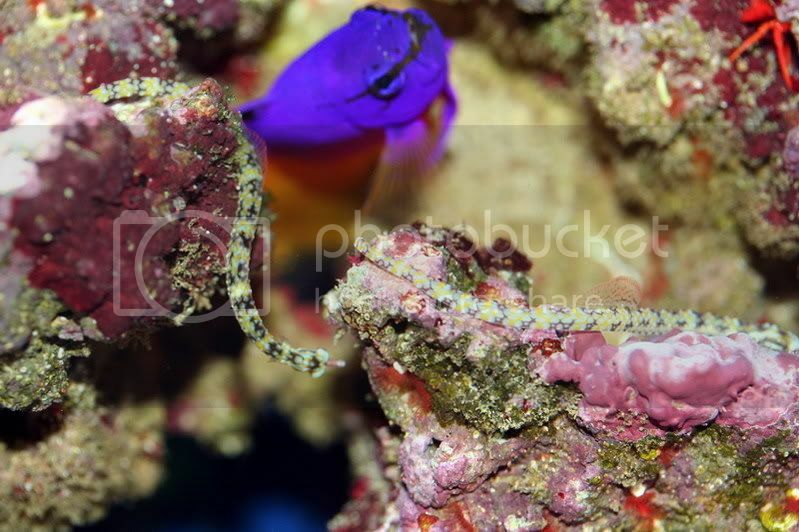 They live in the same habitat as bluestripe, but usually deeper and they get much bigger, in my reef I also have a pr of bluestripes that I collected last oct. I've had them for more then a year. They must be common in the correct habitat because every dive I've looked for them I have seen them, the bluestripes I've only seen a few times. My pair breeds every 6-8 weeks, and the fry hatch, every once in a while I find a larger juv swimming around, but I don't have the space to seperate or raise the fry, maybe in the future. Oh that is so cool. Your location says Fl, but you are talking about diving in Hawaii? I thought bluestripes were from Africa? I added a gorgeous male bluestripe just the other week. My old eyes are getting bad, because I could have sworn my other was a female. They begain to fight right away, the new one winning. So I gave my other one away to a friend. That is sweet that you can get them to eat frozen. That's what I like about the bluestripes, they will take prepared food. I spend 1-1.5 months collecting in hawaii every year. 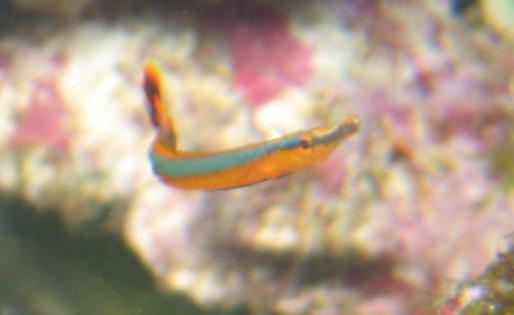 The bluestripes are found all over the pacific even along the tropical coast of mexico down to at least panama. The best colored ones come from africa, hawaii has a dull blue and farther east they tend to lose the blue color, but they are still the same sp, Doryrhamphus excisus. 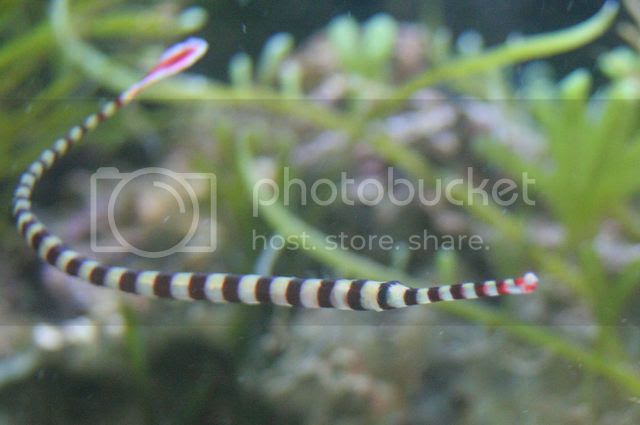 That redstripe is really cool seems like a very interesting species. 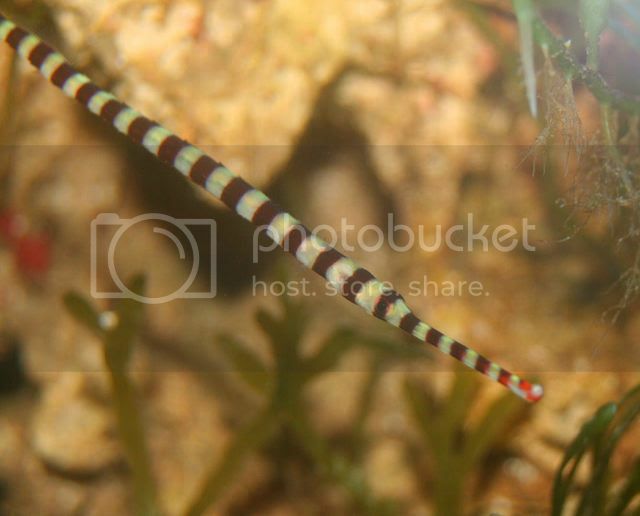 Thanks for sharing that info about the red striped pipefish. I'm going to go on fishbase.org right now to look at it. I love Doryrhamphus pipes! Science demands something else--that we shall transmit to posterity a less perishable inheritance. 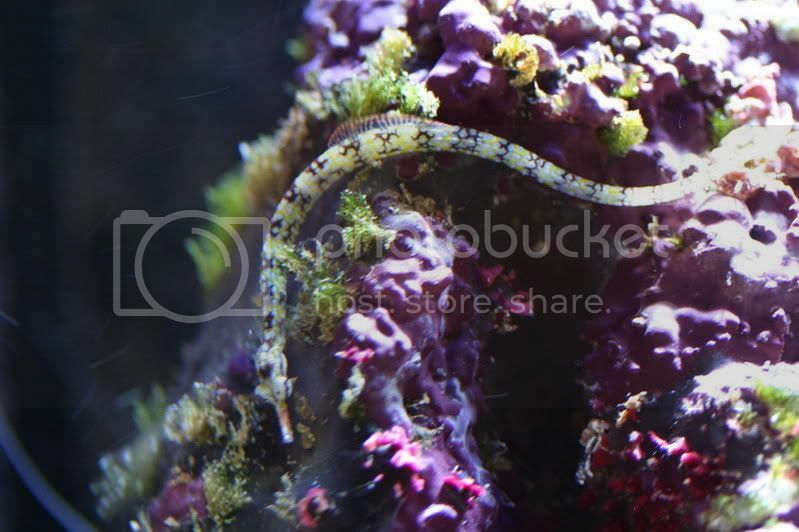 my dragonface pipefish in my reeftank! click on red house for pics! Not as bright blue as the african ones, but I like them. What can't you keep these guys with? I thought they had similar requiriments as seashorses. 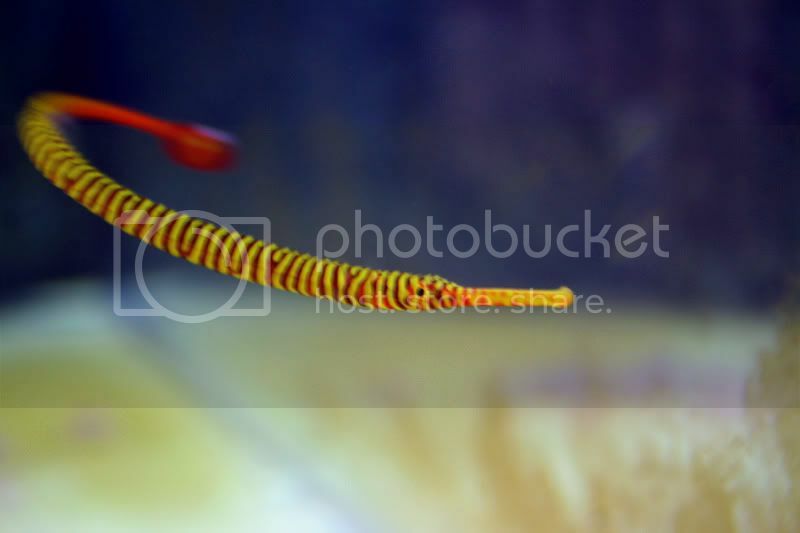 I think its a common misconception that these need to be kept in their own species aquarium.